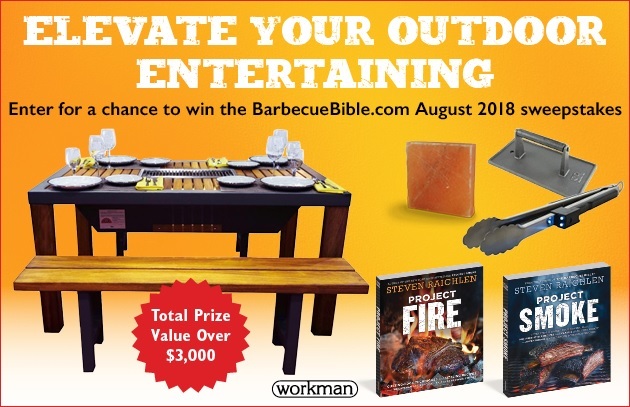 Enter before September 15, 2018, for a chance to win a fabulous prize package from our partners! The sweepstakes grand prize is a stunning Angara grill table from iBBQ. (Perhaps you saw a similar one this summer on Steven Raichlen’s TV show Project Fire on American Public Television.) Constructed of South American tigerwood and marine-grade stainless steel, this handsome table features a built-in gas grill with 15,000 BTUs and bench seating for four. Marrying European design with American ingenuity, it’s the ultimate expression of Social Grilling™ as guests grill their own food, from appetizers to desserts, in a convivial, intimate setting. As the host, you’ll finally be free to enjoy your own party! The propane tank is cleverly hidden in an attractive and useful wooden side table. The package retails for $2,950. One copy each of Steven Raichlen’s Project Fire and Project Smoke: Find inspiration in both classic and boldly contemporary techniques. With 200 ingenious recipes between the two books, you’re sure to find the perfect dishes for your next gathering. A Salt Block from The Meadow: This 10x10x2 inch salt block is large enough to cook for a small dinner party. Bring dazzle and dramatic flair to every meal, enhancing the flavor of every food you place on it. Best of Barbecue tools: Using a Cast Iron Grill Press to press foods down on the grill decreases cooking time and creates impressive grill marks. Coupled with Lumatongs for easy maneuvering of foods while grilling, your guests will have great fun helping prepare the feast. Use your email address to complete your entry below. Come back every day for an additional entry to win! NO PURCHASE NECESSARY. Open to US residents of the 48 Continental United States, age 18 years as of August 15, 2018. Sweepstakes begins at 12:00 a.m. Eastern Time (ET) on 8/15/2018 and ends at 11:59 p.m. ET on 9/15/2018. Click here for official rules. Void where prohibited.